The rail traffic between Málaga airport and the central train station María Zambrano (line Cercanías C-1), which is used by thousands of people every day, will be closed from Saturday, May 16th until Thursday, May 21st due to the construction of a second runway and an underground access to the new terminal. 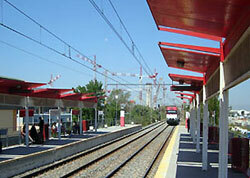 The first cut is set provisionally for this Saturday, although RENFE admit that a definitive date has not yet been set. Bus services will be provided to connect the airport stop and Málaga city centre, but the trains between the airport and Fuengirola will circulate as usual with the same frequency.